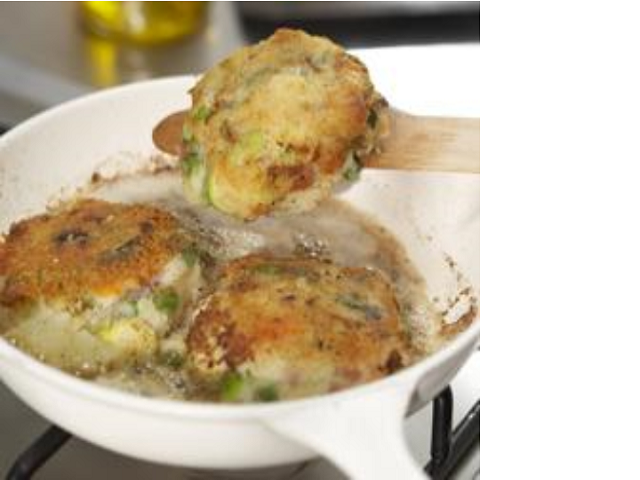 Freeze ahead: These bubble and squeak cakes also freeze brilliantly so if you don’t manage to eat them all you can enjoy them another day - simply freeze them at the end of step 4. Heat the oil in a frying pan and cook the finely chopped onion for 4-5 minutes until soft. Add the cut bacon and cook for a further 3-4 minutes or until it begins to turn a golden colour. Add the mashed potato, cooked vegetables and cheese to the bowl and season well. Mix well and divide the mixture into six portions. Using your hands, shape each portion into a round cake. Put a little flour on a plate and coat each cake in flour on both sides. Put onto a greased baking tray and brush with a little melted butter. Bake in a preheated oven (200°C/400°F/ mark 6) for 25 minutes or alternatively fry on both sides until golden brown.